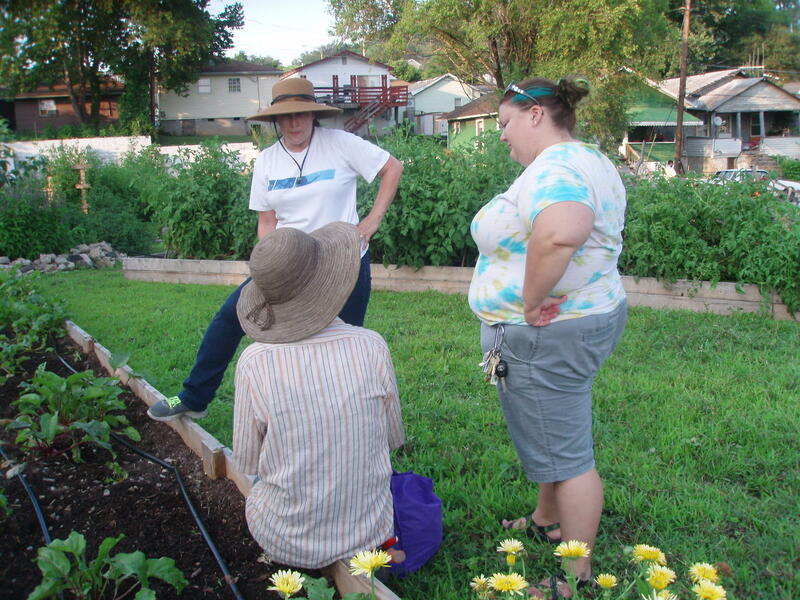 Meg Reishman (sitting), Kathy Moore (l) and Jenny Totten (r) are planning their mid-summer planting of vegetables for the garden. “Oh my goodness, the green zebra tomatoes were absolutely my favorite. They are just absolutely luscious!” says Kathy, who works a day job, like most of the other growers, outside the SAGE micro-farm. She and the other SAGE growers also earn a few hundred dollars apiece at the end of the year based on the group’s produce sales. 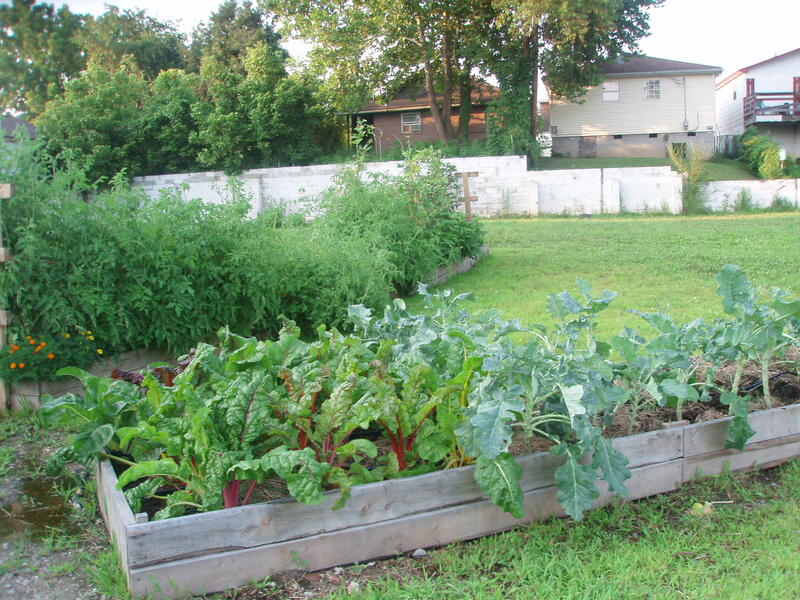 The food is grown on Charleston's West Side, in a high-crime area with many vacant lots. Over the past two years, the SAGE program has transformed two of these lots into working micro-farms. New this year is the Rebecca St. garden, with its unusual swirling starburst shape. 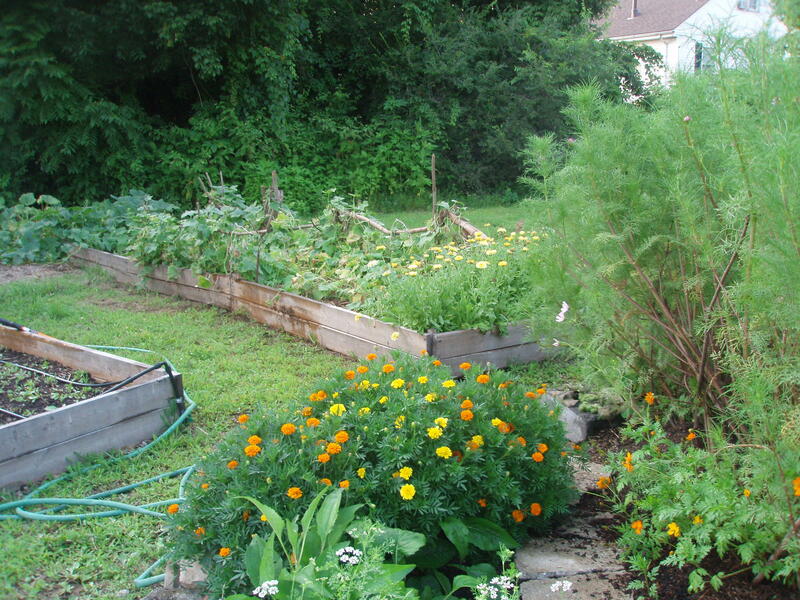 At the center of the beds of squash, kale and tomatoes is a bright circle of sunflowers, zinnias, basil and cilantro. Kathy is surprised that the garden's design has been so successful. 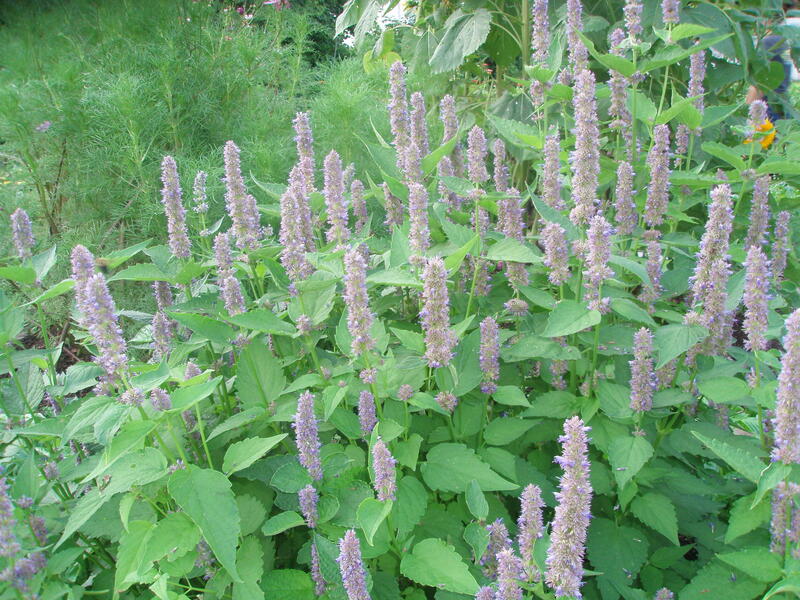 SAGE sells edible flowers to a local restaurant in Charleston called Mission Savvy. The flower and herbs are grown in a circle at the center of the Rebecca Street garden. The SAGE program teaches growers like Meg Reischman how to make a business plan and how to choose the most profitable types of produce. “I was having a difficult time sitting down and figuring out what my break even price was, and whether it was worth growing it or not, making a plan," Meg says. Many of the students struggle with these questions, says SAGE instructor Dr. Dee Sing-Knights, Assistant Professor of Agricultural Economics with West Virginia University’s extension services. She teaches the SAGE growers how to manage small businesses and how to market their produce. She tells the growers to make sure the public knows that SAGE’s organic produce might cost a little more than supermarket vegetables, which often come from larger, more mechanized farms. “I always tell them, you have to tell your customers that listen, the reason this costs more is I squashed my bugs by hand!” says Dr. Singh-Knights. 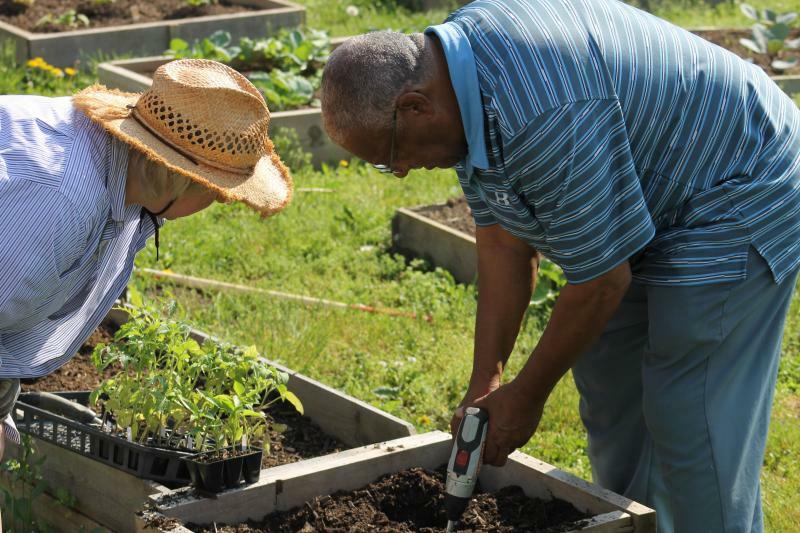 The SAGE growers are also learning to educate more potential customers about the value of spending money inside the community, versus sending the money out of state by buying food at a chain store. Even if the 18 SAGE graduates never become full time farmers, this morning for breakfast they are probably all making food using at least one ingredient they grew themselves. This year, the group has seen an increase in the sales of produce and flowers at their local Saturday markets, as more customers are enjoying the fruits of their labor, too. **Music by Sugar Short Wave. Like many towns across much of the state, Wheeling is home to a lot of abandoned, depressed, impoverished areas susceptible to crime and drug epidemics. The region has depended largely on the coal and steel industries, which are declining. The population is decreasing along with the economy and the vitality of the communities. A small group is tackling several major projects with the hope of changing all of that. 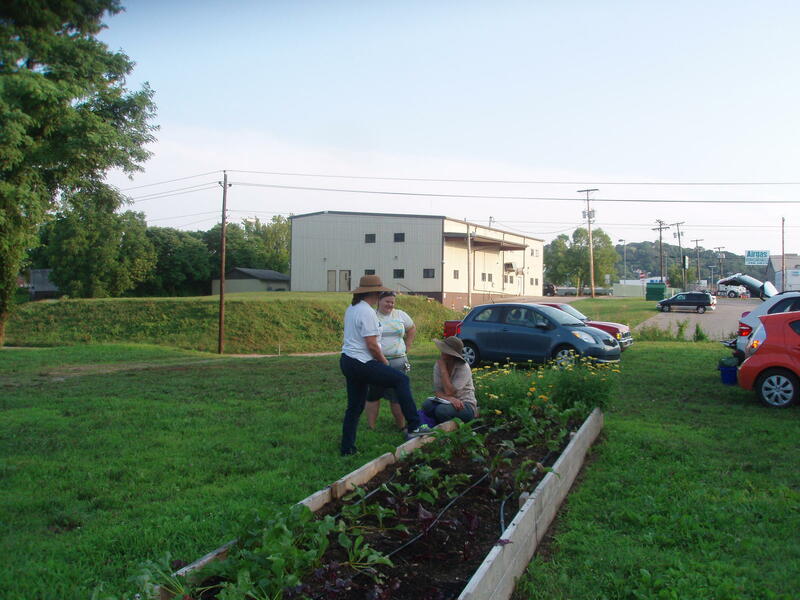 The projects all center around infusing the town with locally grown foods, and educational opportunities to teach residents how these foods are grown. 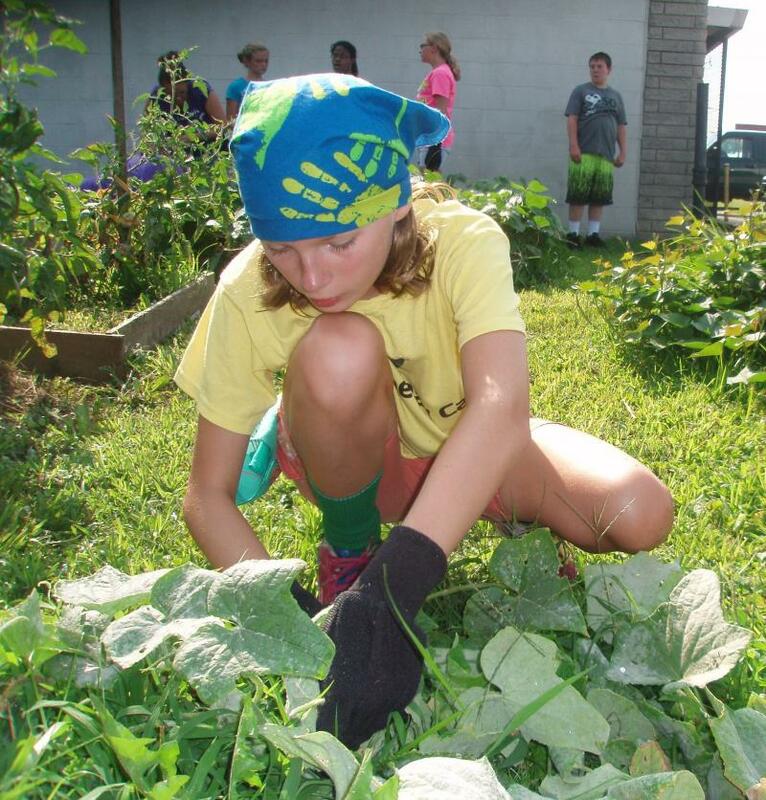 There are eight initiatives already in motion and the fledgling non-profit, Grow Ohio Valley, has raised more than $200,000 so far to support their efforts. They hope that instead of being known as a dying town, Wheeling can become a regional food production hub.